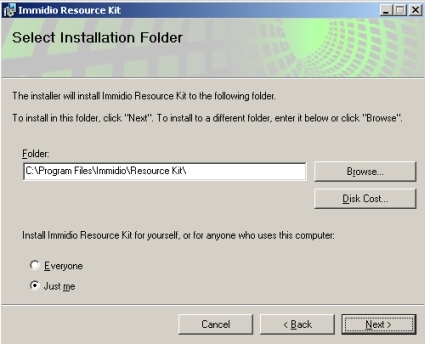 The Basic Resource Kit is delivered as a single MSI installation file. The installation is straightforward. During the wizard the license agreement need to be agreed and the destination location are the only two question asked. For the latest additions to the Resource Kit the Virtual Battery Indicator and the ActiveApp Scanner dedicated downloads and installations are provided. I will mention this separately in this article in the separated paragraphs. So first take a look at the utilities installed on the Terminal Server. When a server is installed the registry keys get a date value of the installation date. Normally this is not a big issue, but with Terminal Servers and the Shadow key this can cause that user settings are reverted to default when a new server is added to the infrastructure. In this previous article I discussed this behavior in detail and the possible solution. One of the solutions is to configure the Shadow Key date stamp with the same time. This is exactly what the Registry Time Stamper can be used for. Within the GUI you select the registry key you would like to change the time stamp. You can also create shortcuts to registry key, so you don't have to browse to the key. This utility can be used to check basic settings and functions of a Terminal Server mode. You only need to start the executable and the information is displayed. The utility is most useful to quickly check if the settings on the Terminal Servers are configured as you expect. App-V Ping is a command-line to determine if a Microsoft App-V server is up-and-running. The utility can be started with a set of parameters to connect to the App-V servers. The tool checks more than a response on App-V communication port and also provides a set of error codes why the connection failed. With those error codes you can determine the (possible) problem with the server and could create a scripted solution. Also added to the Immidio Resource Kit is ReconnAct, which was earlier released as a freeware utility by Login Consultants. In this article I already described this utility in detail, so I refer to that article because the utility has not changed. As described earlier this is a separate download and installation path. The utility will display the battery status of the notebook used to connect to a RDP session (so you don't forget to plug your notebook in outlet on time). To accomplish this small installation should be performed on the notebook (which connects to the Terminal Servers). The installation is really easy, again only a license agreement and the destination location should be specified. When the client part (a RDP virtual channel) is installed the executable can be stared within the RDP session. 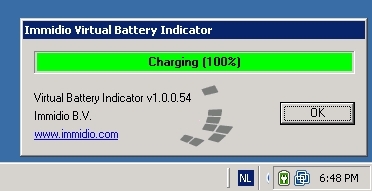 Within the system tray a battery indicator is displayed showing the status of the battery. With a right mouse click you get some more information. Also the utility will display a warning message when the battery capacity will reach a specified limit. By default this is 30%, but this can be adjusted by starting the executable with parameters to specify the percentage and optional a customized warning message. This utility is the latest addition to the Immidio Resource Kit, which is also available as separated download. The utility is developed to monitor which applications are used during a user's session and collect information about the user environment. Therefore it can be installed on workstations as Terminal Servers. Just as the other utilities the installation is a piece of cake. After the installation the program needs to be started under the user context, this can be arranged for example using a logon script or adding a shortcut to the startup folder. The program needs to be started with parameters. With those parameters can you specify which options (like installed software, regional settings, processes, printers, shell folders and policies) will not be monitored by the program. The logfile is the only required component (by default all options are monitored). The utility will probably used during migration projects to determine which settings should me migrated and which applications the user is working with. All information is collected using the XML format as displayed in the above figure. This makes it possible to use the logging to create reports, but unfortunate the utility does not offer (at this moment?) such functionality. You should find a way to read the information out of these log files. It's always good to see that software manufactures also supply freeware tools to make life a bit easier. 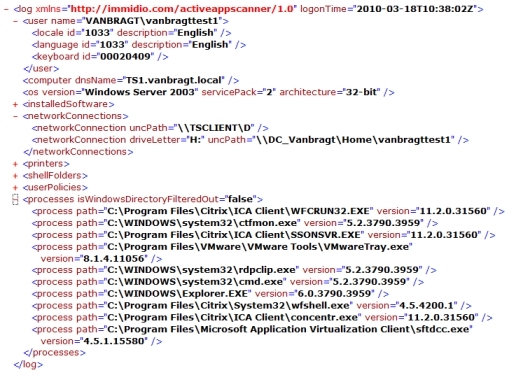 With the Resource Kit Immidio is supplying some nice utilities like the registry time stamp utility (the other possibilities does not support current dates anymore), the App-V-ping utility and ReconnAct. Some of the utilities are nice utility but are usable for a specific audience. At last the ActiveApp scanner has lots of potential, but the lack of creating reports out of the logging is a big disadvantage.